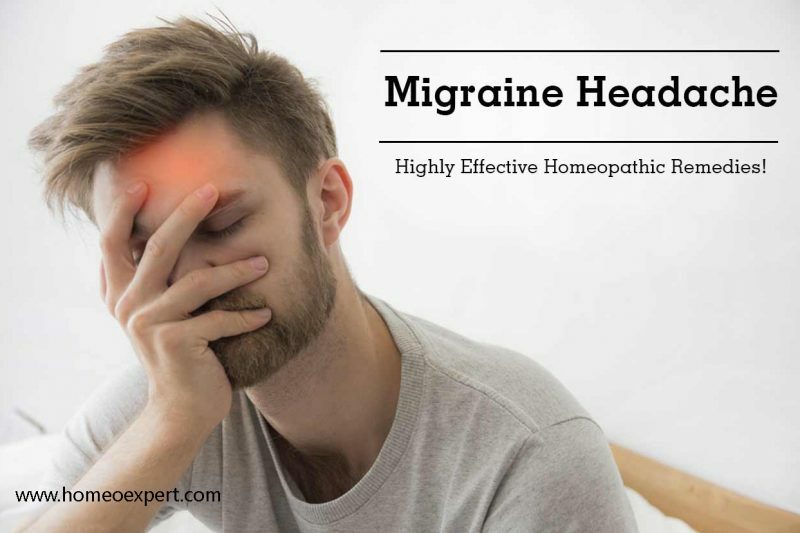 In this article of Homeo Expert, we shall discuss the best homeopathic medicine for Migraine or Headache. We can call it a throbbing pain or a pulsing sensation which normally occurs at one side of the head. There are several symptoms which accompany it including vomiting, nausea and extreme sensitivity to sound and light. Migraine attacks can lead to significant pain which remains for hours and days and can become severe too. Headache is a synonym of migraine and it affects one side of the head. Salty foods can become a cause of migraine or headache. Highly processed food may cause migraines. People who have been facing migraines should not skip their meals or fast. They can do it by taking an advice from a doctor. Alcohol and caffeine can become a cause of migraine. There are some artificial sweeteners including aspartame can lead you to migraine. And famous preservative like monosodium glutamate (MSG) can also become a cause of headache. Unusual loud noises, bright lights and strong smells may set the path to migraine. It also includes bright sun, perfumes, paint and smoke as well. Hormonal changes like estrogen fluctuation in women can trigger migraine. If a woman has a history of migraines, she will report headaches before and after the span of menses or periods. There are some other women who develop this feature during the pregnancy or menopause period. If you use medications like birth control or hormone replacement therapies, it can skyrocket your migraine. At times, these medicines can also reduce your headaches as well. Stress, whether it is on work or at home, can lead you to migraines. Extreme exercise or physical activity including sexual activities can cause migraine. Changing in weather can also trigger headache. If you are not fulfilling the need of your sleep on regular basis, you may face migraine. Too much sleep can also become a cause of migraine, therefore, do not miss your sleep. There are three stages where migraine begins that is, childhood, adolescence or early adulthood. There are four stages of migraine or headache and it has to pass these four stages including prodrome, aura, headache and post-drome. It is not necessary that you will see all the stages. One or two days before the onset of a migraine, you may face different changes that will give you warning of an upcoming headache. If any of your family member is suffering from headache, you have a definite chance to develop one. There is no age of migraine and it can occur at any age. There are three times more chances of occurrence of migraine in women. But during the span of childhood, migraine affects boys more than girls. At the time of puberty, the girls become more prone to migraine. If you are a female and having migraines, there is a chance that it begins after the beginning of menstruation. Belladonna is one of the best homeopathic medicines for migraine where a throbbing and pulsating headache is present. The patient of Belladonna also feels fullness in the head. Light gives rise to a headache. He also cannot bear the noise. In some cases, exposure to cold air can lead to migraine. At times, head bath with cold water can come up with a migraine. The hard pressure on the head reliefs the patient. If a patient feels excessive congestion in his head with a headache, Gloninum is one of the most helpful medicine for treating these attacks. The patient feels that his head will burst and it is very large. The patient of this medicine feels severe pain that he holds his hands in hands. In Gloninum, the eyeballs of the patient seem extended. He feels extreme heaviness in the head. He also feels an unbearable heat around his head. When he uncovers his head he gets relief from the headache. The patient feels better with sleep and walking worsens the condition. If a patient gets migraine headache from sun exposure, Gloninum is the best and suitable Homeopathic medicine for the patient. Spigelia is another Homeopathic medicine for Migraine if a migraine is left-sided. We prescribe it if the location of a headache is over the left temporal region, eyes and forehead. In most of the cases, the pain starts in the occipital region of the head, it rises and settles over the left eye. The pain is throbbing, pulsating and violent in nature. The patient feels a sensation of a tight band around his head. If the patient bends down it will make the pain worse. The symptom of severe pain in the eyeball may present. The movement of eye aggravates the pain. Sanguinaria Canadensis is another excellent Homeopathic medicine for right-sided migraine. The pain begins from the back of the head that is, occipital, ascends and settles over the right eye. If the patient lies down in a dark room he feels relief. At times, sleep also relieves the pain. We prescribe Sanguinaria when fasting gives leads to migraine or headache. It is also prescribed when a headache starts in the morning and reach at its climax during the day and remains active until the sunset. It is also helpful for those women who are having migraine during the stage of menopause. Iris vers is an excellent Homeopathic remedy for migraine when it begins with the symptoms of nausea, vomiting or acidity. Additionally, the patient may feel burning sensation in any part of the alimentary canal. He may vomit or feels acidity which is sour or bitter in nature. Belching that is bitter in nature along with intense burning behind the sternum and throat can be observed. If a person feels headache with diarrhea, it means he is asking for Iris Vers. This remedy is suitable when migraine starts with a blur vision. Nux Vomica is one of the valuable Homeopathic Remedies for migraine with gastric troubles. If a migraine occurs due to indigestion, flatulence, constipation and piles, we can recover these symptoms by using Homeopathic medicine Nux Vomica. Nux Vomica works well when a migraine or headache becomes worse after taking coffee, spicy food and alcoholic drinks. In Nux Vomica, a headache can be located in any part of the head. The patient of this medicine wants to press the head with something hard to get relief. Apart from Gloninum, there is another Homeopathic medicine in materia medica which gives quick relief in migraines due that occurs due to sun exposure. The symptom of vertigo also appears in some cases along with headache. The patient also feels the heat in the head along with congestion. In Natrum Carbonicum, the patient may feel a shooting pain in the forehead. Homeopathic remedy Natrum Muriaticum is the best prescription for headache attacks that worsen during the menstrual cycle. A migraine may occur before, during or at the close of a menstrual cycle. There is another unique symptom in Natrum Muriaticum that is, migraine starts with the sunrise, continues throughout the day and disappears after the sunset. It is known as the “sunrise to sunset headache”. Also, in some cases, the patient feels that a little hammer is knocking on the brain and Natrum Muriaticum can cure it. It is also suitable for school girls who suffer from headache or those girls who are anaemic. Homeopathic doctors also consider it the best medicine where the patient feels numbness in the nose, lips or tongue before the onset of a migraine attack. Sepia is one of the most suitable Homeopathic remedies for migraine attacks in women during menopause. In these cases, terrible headaches occur during menopause. A headache becomes worse indoors and the open air gives relief. Nausea and vomiting may occur during migraine. If the patient lies on the painful side of the head, he gets relief. The top of the head may feel cool in menopause cases. Generally, the patient feels hot flushes, at times, with sweat are observed. If a migraine develops from stress, it is the time to use Homeopathic medicine Kali Phos. The symptoms of stress, tensions and worries give rise to a migraine and it highlights Kali Phos. Such headaches are common among the students who remain involved in stress. The patient also feels weakness and exhaustion along with a migraine. Epiphegus is a helpful Homeopathic remedy for treating migraine where exhaustion – mental or physical, set the stage for headache. This homeopathic medicine is used where the slightest change of routine work leads to a migraine attack. Although it is useful for both sided migraine, yet comparatively better results are observed in the left-sided headaches with Epiphegus. Another unique symptom is the increase of saliva with constant inclination to spit. Homeopathic medicine Cyclamen is highly recommended for migraine attacks that start with flickering, fiery sparks before the eyes or dim vision. These visual symptoms that come before a headache are referred to as aura. Cyclamen is also a useful medicine when headache starts on rising in the morning. The patient may face a shooting pain in the temporal region. The patient also feels vertigo, especially when standing, may accompany the headache. Natrum mur is very valuable homeopathic medicine for migraine when it occurs due to eyestrain. Ruta is another important remedy for migraine caused by eyestrain.